The following is an overview of Shormann Mathematics, Algebra 1, the newest product from DIVE Math and Science! Click here to read the complete document that covers Shormann Math core ideas, course description, and Algebra 1 table of contents. Unlike our DIVE Math Lectures that teach the content in textbooks authored by the late John Saxon, Shormann Math is a standalone curriculum. Shormann Math is designed to connect students to their world and their Creator by using an incremental approach with continual review to teach 10 major math concepts from a Christian foundation. The 10 major concepts are: number, ratio, algebra, geometry, analytical geometry, measurement, trigonometry, calculus, statistics, and computer math. The first course produced will be Algebra 1, followed by Algebra 2, Precalculus and Calculus. If you are wondering “Where’s the geometry?” in the 4 courses listed, it’s there! Because scholars consider mathematics to be “the language of science,” Shormann Math teaches math like a language, where you don’t just learn nouns for a year, verbs for another year, etc. You learn a little of each concept, combined with lots of review, and then you combine the different concepts together. So, Shormann Math Algebra 1 and 2 in particular will also contain a rigorous survey of geometry, including lots of proofs, even some straight out of Euclid’s famous book, The Elements. We’ll even cover non-Euclidean geometry, and show students how the concept of proof applies to all of mathematics, not just geometry. All the geometry, and trigonometry, that a student needs to be ready for the SAT or ACT will be covered in Algebra 1 and 2. Scroll down to the Algebra 1 Table of Contents where you can see more detail about geometry coverage. While Shormann Math will guide your child through high school algebra and geometry, that is not our primary goal. And it is definitely not our goal to align Shormann Math with the Common Core standards. Our goal is to connect your child to their world and their Creator by teaching them math, the language of science, from a Christian foundation. And because the last 300+ years of technological innovations can be connected to calculus in one way or another, we will present calculus early and often, and not in an intimidating way, but in a way that is based off things students already know. 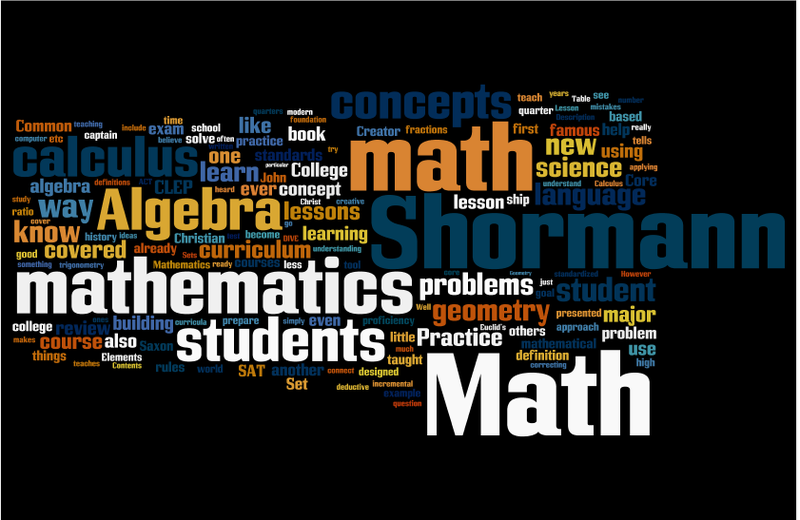 Unlike many new math programs, Shormann Math is not about an entirely different approach. Instead, Shormann Math builds on a foundation of time tested and proven methods. Famous mathematicians and math educators like Euclid, Euler, Saxon, Whitehead, Kline, Sawyer, Nickel, etc. were studied for years before work on Shormann Math began. For 2014-15, Shormann Math will be offered as a live, online class only. For more details on Shormann Math, including the Algebra 1 Table of Contents, click here. Then, if you are ready to dive into this new adventure in learning math, click here to register!